On 12th March 2016, works by CNM members Julia Usher and Jenni Pinnock will feature in a concert celebrating women composers, also including pieces by Judith Weir, Charlotte Bray, Cheryl Frances Hoad, Anna Boyd, Amy Beach, Clara Shumann and others. 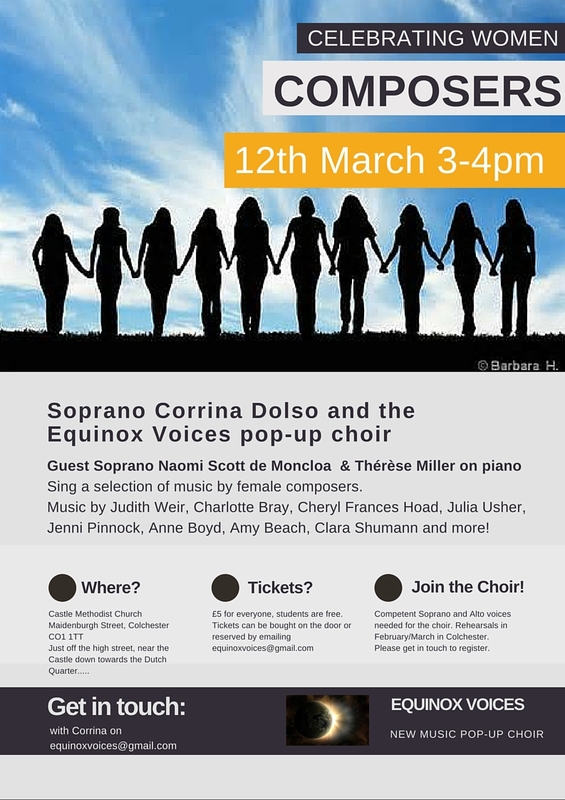 Soprano Corrina Dolso will be performing along with her new Equinox Voices pop-up choir, joined by Guest Soprano Naomi Scott de Moncloa and pianist Thérèse Miller, at Castle Methodist Church, Maidenburgh Street, Colchester CO1 1TT. The concert runs from 3-4pm; tickets (£5 or free for students) will be available on the door, or can be reserved by e-mailing equinoxvoices@gmail.com. Download the pdf concert poster here. The choir is seeking competent sopranos and altos to take part in the concert; rehearsals will take place in February/March in Colchester. Please contact equinoxvoices@gmail.com to register. This entry was posted in Concerts, member news, performance and tagged Corrina Dolso, Equinox Voices, Jenni Pinnock, julia usher, women composers on January 9, 2016 by AlexanderBlustin.